For this entry we will discuss the cut of Sean Connery’s suit jacket. Many call this the “Conduit Cut”, after tailor Anthony Sinclair’s premises on Conduit Street in London. Cyril Castle, Roger Moore’s tailor in the 1960s and 70s, was also on Conduit Street, and I don’t think it would be fair to not equally consider his contribution to the “Conduit Cut”. 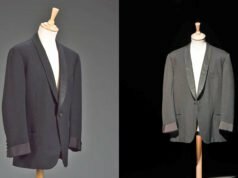 Sinclair’s and Castle’s jacket cuts were very similar, though while Sinclair was cutting button two suits for Connery, Castle was making button three suits for Moore to wear on The Saint. Let’s get back on track and take a look at Sean Connery’s suit jacket. The example pictured is a button two, single vent jacket from a suit made of charcoal grey dupioni silk, worn in From Russia With Love. All of Sean Connery’s suit jackets have a button two front, and the button stance is considerably lower than what is popular right now in 2010. The low button stance emphasizes his waist and the “V” shape of his torso. The waist is nipped in to give the jacket shape although I wouldn’t call his suits slim, merely just fitted. The chest is cut full with a bit of drape, and the shoulders are natural but look large due to Connery strong and masculine physique. There is a subtle roping in the sleeve heads. The gorge (where the lapel and collar meet) is at a standard height, not too high as is typical today. Though the narrow lapels and pocket flaps date this suit to the 1960s, the cut of the suit overall is timeless. The cut of the jacket isn’t as slim as those most people associate with the 1960s. The button two front was known to be popular in the 1960s in America, but in England the button three suit was still the norm. It wasn’t until the 1970s that the button two suit was fully accepted in more conservative circles there. 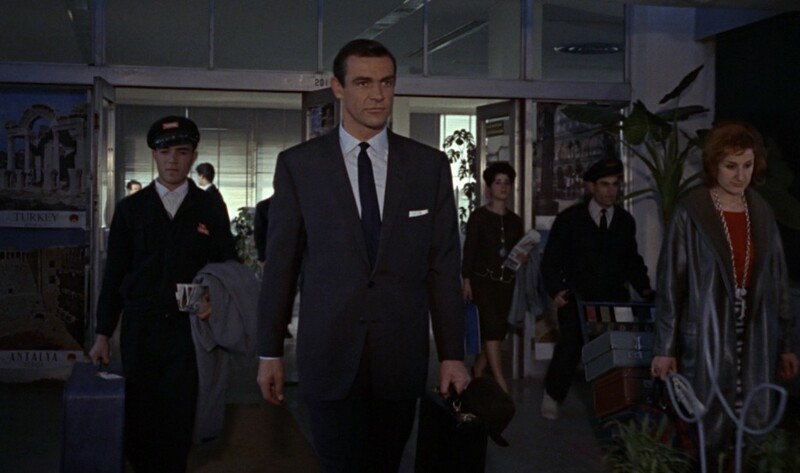 Sean Connery’s suit trousers have double forward pleats, the kind that open towards the fly. They have a long rise and sit at Connery’s natural waist. The legs are tapered down to the bottom for a military-like appearance and are finished at the bottom with turn-ups (cuffs) to weigh the trousers down and keep them looking neat. The waistband has an extended tab that hooks rather than buttons, and there are three-button side-adjusters on the side in the “Daks tops” style. See a closer look at Sean Connery’s trousers that accompany his suit jackets. Connery’s pale blue shirt is from Turnbull & Asser and has a spread collar, front placket and two-button cocktail cuffs. The tie is a navy grenadine, tied in a four-in-hand knot. He wears a white linen folded pocket handkerchief and black derby shoes with the suit. One of the things I notice from Connery's jackets is that they seem a little short. I'm actually watching Dr. No right now, and his jacket *only just* seem to cover his seat. I'm also curious as to what Connery's jacket size would be. Granted, he's wearing bespoke, but I have the feeling that the modern off-the-rack equivalent would probably be…42 regular? 44 regular? Connery did some bodybuilding in his younger days, and I think he looks to be at his beefiest in Dr. No, but even there, he's not huge. I'd say 42 reg. On the other hand, I think I remember reading somewhere where Turnbull and Asser still keeps all the files it's ever compiled over the years, and there was a picture accompanying the article that had Sean Connery's client card, and his neck size was 17. That's pretty big; about an inch bigger than I'd expect, and indicative of a suit size larger than 42. Unfortunately, I can't pin down this photo, so all I have to go on is my addled memory. Sean Connery was 6'2.5" tall, and so probably would be a long length. I'd suspect his chest size is about a 44. It was popular in the 60s, as it is now, to cut the jacket on the shorter side. They were cut shorter to lengthen his legs because much of Connery's height is in his torso. That's one reason why his trousers had a very long rise. The key is to make the legs look the longest possible whilst still keeping everything proportionate. And I would believe that Connery has a 17" neck. Cary Grant had the same and he was skinnier than Connery. At the Fleming exhibit at the IWM they had a few coats of Connery's. I was quite surprised by the size, to be honest. I always knew he was big, but it was apparent that he was at the very least a 44" chest. I know there is much debate over what constitutes a correctly cut suit. I would just say that there are traditionalists who have certain opinions. However, the cut of a suit has been a dynamic process over many, many years, resulting in different trends. For example, the hem of the jacket has been raised in recent years and many prefer their cuffs longer. There are many other examples, obviously. Connery's coat length might seem high, but to my mind it is just right. It flatters his shape and that, after all, is one of the most important aspects in a suit. Nothing flatters the male physique more than a suit, and Connery had a natural build that was perfect for suits, unlike the Debonair Cary Grant (who had a large head, thick neck, bow legs and narrow chest) and who used fine tailoring to even things out. I feel that after Terence Young went the real, natural Sean Connery began to come across more than the refined character trained by Young. After a while, I suppose he got bored and stopped trying. 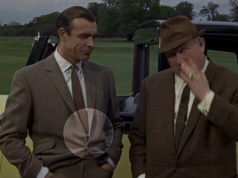 Compare Connery's Bond in From Russia With Love with Diamonds Are Forever – He appears to be scruffier in appearance, (long neck hair, bushy sideburns, overweight, bad teeth) less refined in manners, bored-looking and his Scottish brogue thicker, while earlier he attempted to either sound English or speak more clearly. You can see this progression throughout his period as Bond, he seems to be more self-confident, assert Sean Connery more. 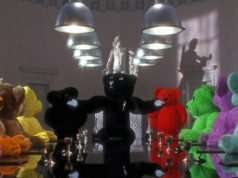 The producers thought it best to get someone rough and tough and refine them, than to get someone fey and refined and make them seem tough. It worked, but I think some of the polish wore off! Back to the suits, the sixties Sinclair/Conduit cut looks fantastic and ever-contemporary. To me it represents the standard suit shape, perfection. And any deviation over or below that cut is faddish and ultimately dates. It is the standard to which we return, infinately more form flattering than the broad lapels and ties (and trousers) of the seventies (Moore) and then the high-buttons of the nineties. It's all about flattering or enhancing the male shape which is the one relative constant that cannot be deviated from. I think perfection was reached here. Note that there is not much hourglassing here at the waist, as in today's interpretations of the sixties style cut. I prefer this. Are all suit tailors familiar or atleast know of the “Conduit cut”? Bc I plan on buying a “Glen-Check” suit in March and wanted to tailor it to the “Conduit Cut”. Does anyone know how would they explain to a tailor how and what a conduit cut looks like and how to get it just right? Please help if you can i’d greatly appreciate it. Just show them the pictures. Most tailors will have a house style, but should vary it to give you what you want. It’s not that simple. Even if the tailor is willing to try (and many established tailors will not), he might be making a style out of his comfort zone and it might not turn out so well. Some tailors are comfortable in making different styles. It’s best to go to someone who already makes a middle-of-the-road Savile Row style suit, not as clean as Huntsman but not as relaxed as Anderson & Sheppard. Can you tell us more about the cloth of the suit’s picture, please ? You say it is a charcoal grey, but in the movie, particulary in indoor scenes, it seems to me one can notice some very dark purple in the colour ; it seems to me it isn’t as a simple dark grey like the one Connery wore at his arrival in Jamaica or for his travel in the Orient Express. Matt , l recently had a grey Dupioni silk suit made bespoke for me at Anderson & Shepperd . The people there told me that Silk suits tend to wear poorly. They told me that silk suits are not durable and that the trousers , in particular tend to wear out very quickly through the seat and thighs. How true is this statement ? They have more experience with silk than I have. I have silk/linen blend trousers that I have did not wear so well. Silk has little elasticity, which may be why it doesn’t wear so well. Having worn a Gray Dupioni Silk suit once every week for a year now ( made Bespoke by Anderson and Sheppard ) , l have reached the following conclusion : It is an extremely impractical and delicate fabric which ( while OKAY for a jacket ) is simply not robust enough for a suit if you plan to wear it more than a few times. The Trousers tend to wear through VERY quickly and they also lose their shape at the knees very fast. It feels like a very big loss , considering how l saved six case’s pay to invest in that suit. Huntsman and A&S had both warned me against getting a pure silk suit . I followed Huntsman’s advice but decided to ignore Anderson and Sheppard and commission the suit anyway. The did a fantastic job with the suit , but the fabric is just not robust. I can see why the filmmakers had Connery’s Bond wear only one silk suit in the series. It would not last even one fight scene without taking damage. But… It’s a beautiful looking fabric.